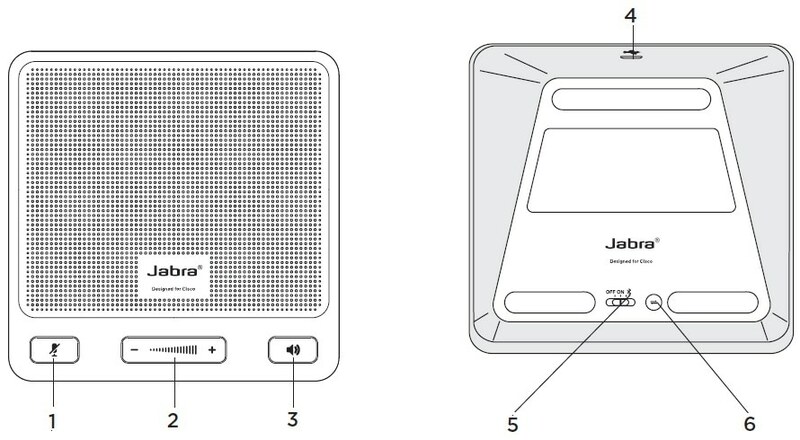 The Jabra Speak 450 for Cisco is a speakerphone that greatly enhances the user experience and the sound quality when collaborating on Cisco Jabber for Virtual Environments. Connect the Jabra Speak 450 for Cisco via Bluetooth® or USB and you can participate in phone calls or teleconferences with both hands free. Take notes or navigate around a shared desktop presentation, all without disrupting the conversation. Invite a colleague to join you at your desk, and thanks to 120 degree coverage, Jabra Speak 450 for Cisco gives you an instant mini-conferencing facility. Let the frustration of muffled sound on teleconferences be a thing of the past! Jabra Speak 450 for Cisco gives you professional sound quality, with wideband audio to enable crystal clear, natural-sounding conversation. Connect Jabra Speak 450 for Cisco to your Cisco solution via Bluetooth and you’re free to roam up to ten meters away from your desk, without interrupting the conversation. Both the appearance and functionality of Jabra Speak 450 for Cisco are streamlined to match your Cisco solution. Just connect it via USB cable or Bluetooth ® USB adapter and you’re ready to go. On-device controls let you answer and end calls, mute and turn the volume up or down with ease. It is available in two colors – Dark or Light – and designed with the stylish Cisco look and feel.